Modular V by Arturia is a Virtual Instrument and a Virtual Effect Audio Plugin. It functions as a VST Plugin, an Audio Units Plugin, an RTAS Plugin and an AAX Plugin. Arturia, in partnership with Bob Moog, has made a faithful reproduction of one of the most famous series of synthesizers: Moog Modular. Whether recreating the abstract tonal qualities of the classic electronic soundtracks, or pushing forward the sonic boundaries of today, the Modular V (formerly known as Moog Modular V) is a synthesizer for sound exploration. It has all the vibe and the sound of the original, combined with important contemporary features like polyphony, MIDI control, loading and saving of patches, etc. All the parameters of the original Moog Modular: 9 oscillators, 2 LFOs, 3 filter slots, 1 Noise Generator, 6 envelopes, 2 VCAs. 16 auxiliary VCAs with modulation inputs. 1 filter bank (14 bandwidths available). More than 600 presets, made by professionals. Mono / polyphonic (up to 64 voices per instrument). No aliasing from 0.1 Hz to 16 kHz. Sampling rate: up to 96 kHz. Playable through a MIDI keyboard. Accurate reproduction of the legendary Moog 24 dB low-pass filter. 1 Chorus and Delay Effect section (besides 12 Stage Phaser and Ring Modulator). TAE engine. 24-bits/96 kHz supported. I recently bought the Arturia V2 Collection and this VST was part of that collection. Arturia has hit it out of the park on a number of their VSTs and it seems that the MMV and the Prophet V are their flagship VSTs. The sound is amazing and the VST is rock solid and stable. I've used it in several popular hosts and had no problems with any of them. If you are a knob jocky, then this VST is NOT for you! This is subtractive synthesis in the raw. They way it used to be done before the advent of digital programming circuitry. You need a little understanding of the concepts of subtractive synthesis to get the most out of this VST. You don't have to be a rocket scientist though and once you get used to how to patch modules together, you'll fly around the interface just the same as you would with any other VST. The beauty of the modular is that there is way more flexibility than what you would get out of any other hardware synth that succeeded the modular era, because signal routing isn't the cut and dry oscillator to VCF to VCA signal chain we've all come to see in so many synths. This means you can get some truely unique sounds that are unobtainable by most other VSTs. The downside to this VST is simply the scrolling, but there really isn't any other way to do it on a computer monitor, and if you reduced the size of everything to fit on a screen it would make it harder to see and subtract from the visual aesthetics of this VST. as the filters have been revised there can be differences in cutoff /resonance when importing v2 sounds. a good idea placing a limiter behind it when programming because it can get really loud. digital phasers just passable, i have yet to hear a phaseing emulation that has the slurpy rollercoasting movement of a real analog phaser. of abandoning products very quick. If you’re into synthesis emulations, then there’s an argument for this even if you never used any of the sounds you created. It’s a history lesson in VSTi form. That it sounds really very good is icing on the cake. Initially, it’s daunting and confusing – even though I’ve plenty of years experience programming synths, they’ve been of fixed architecture. Here, before you create sonic motion, you have to join up the building blocks to even create a sound. A blank patch will play nothing – you have to connect a VCO through a VCA by way of filters. Of course, the beauty of a modular is that you can throw the rules to the wind! Its greatest asset is also its biggest weakness; the beautiful GUI. We’re some years in now - so no computer should struggle to render it - but the attention to detail that makes the GUI so enthralling is also the reason it’s so frustrating to program. On a laptop, even on a larger screen, it’s fiddly, where a simple slip if the mouse can unhook a patch cable, or connect wrong, or twist a dial. It suffers the same frustrating portrait aspect as Propellerhead’s Reason. Why not create a landscape alternative to save scrolling up and down? Some of the virtual TRS/phono jack input sockets become potentiometers once connected. On the GUI, it’s as though you were turning the phono socket itself, as you ‘grab’ the hex-socket edge and rotate. A neat use of space, but finding them to turn using your mouse is a real pain. Once you’ve added in a spaghetti of patch cables, the interface can be cluttered and fiddly. You can remove any or all cables, or ask the cables to move out of the way, but with complex patches then you lose the visual feedback. Sound is top notch. Initially I didn’t see what the fuss was about, but having used the MMV in some Tangerine Dream-like tunes, I’m a convert. It sits really well in that kind of mix. Documentation is superb. The manual is extensive, reasonably well written and informative. Every module is dissected and discussed individually. It’s also printed, which deserves top marks. Included in the box is a USB key – even though I haven’t required using it, the synth is serial-based. Credit and thanks to Arturia for not having the cheek to ask us to buy one separately.n As for support – well, it’s worked well for me, and although updates are infrequent all my Arturia stuff works as described. I’ve been using the Moog Modular V since it first came out. If I could only own one soft synth, this would be it. GUI: The user interface looks very impressive, but it’s difficult to use. The most annoying thing is the need to scroll up and down because the entire interface can’t be displayed at one time. I’m sure this is because of the enormous number of modules and controls that made up the hardware MMV and the need of Arturia to make the interface as manageable as possible while staying true to the original instrument. If the entire interface were to be displayed, the controls would have to be a lot smaller than they are. But it makes programming very difficult and time-consuming. Sound: The sound is fantastic! Although I’ve never played with a hardware MMV, I’m guessing that the sound is very similar. At the very least, it’s the best sounding software version of any Moog synth and quite a bit better than many analog-modeling hardware synths. It can produce many types of sounds from a fat, growling bass to high-pitched bells or spacey sound effects. Features: The MMV is loaded with features, including the ability to change the module selection to some degree. It can be used as a VSTi or as a standalone soft synth. The patch cords are a nice touch. Docs: A pretty extensive manual comes with the MMV and it includes several tutorials that range in complexity from producing a simple sound using the least number of modules to complex multi-oscillator sounds incorporating the sequencer. But the real fun of playing with the MMV comes after you’ve learned what works and what doesn’t, and you are able to create your own sounds. Presets: There are plenty of onboard presets that were created by some well-known Moog users. Analysis of them is very helpful in learning to use this complex piece of software. You can also download user banks from the Arturia website or from other sources on the Web. I think it’s worthwhile to create your own user bank from the presets that you find useful, as well as your own presets. Because of the enormous number of presets that come with the MMV, it will make finding the ones you like a lot easier. Support: The few times I’ve used Arturia support, they were quick to respond and very helpful. VFM: The MMV is priced fairly and has actually come down in price since it was first release. MMV2 reminds me of a flight simulator. In front of you is a realistic representation of a Moog Modular with nine oscillators, LFOs, EGs, several filters, a 3x8 sequencer, chorus, phaser, white and pink noise generators, a sample and hold module, a ring modulator, an enveloope follower, fixed filter modules and other modules ready to be connected together with virtual (Reason-like) cables. There is no mod matrix buried under pages of menus. It's all in front of you just like Moog initially designed. In a sense, it is like a primer for sound design. MMV comes with some wonderful presets that get you up and running. There is a fairly good manual that will walk you through the modules and give you a lesson on synth theory. Installing is easy and painless; you just enter your serial number and then you can register to be able to downlaod more presets. I think one of the few cons I have against MMV2 is that to import more presets or banks you have to use the original installation disk. I love the sound. It's warm and gritty. The filters are very responsive. 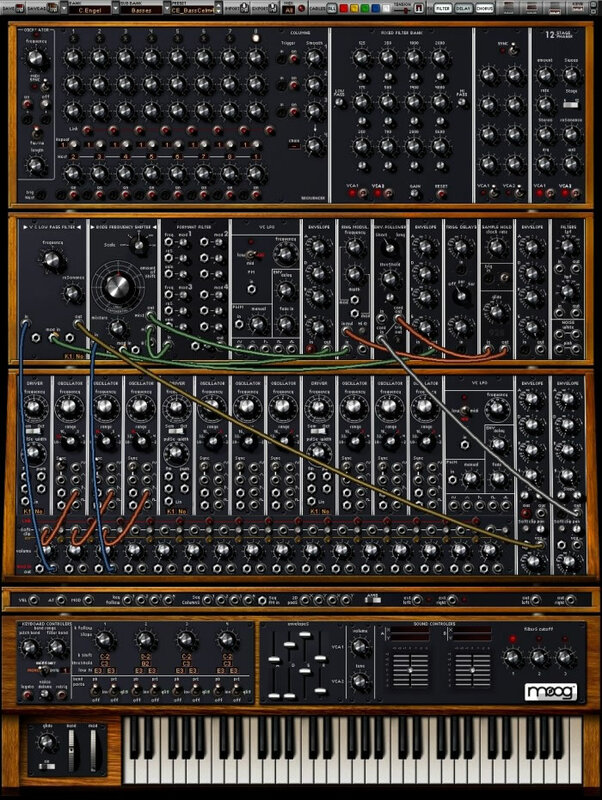 Unlike the real Moog, this virtual version can be polyphonic. However, when adding additional voices the CPU gets gobbled up quickly. Stereo is easily accomplished with the MMV2 because there are two VCAs; each with it's own panning pot. The effect modules are stereo and can be assigned to either or both VCAs. The delay is terrific as is the chorus. The phaser is mediocre at best. I am enjoying the step sequencer. It's very flexible and besides doing the Berlin school thing, it can easily be used to modulate other parameters in the synth. I like that you can have a heavy pad sound going with a light sequence going on in the background for texture. The sequencer can go backwards, forwards, both ways, in rows or in columns. You can configure one or more oscillators to sequence through one line of the sequencer and another set of oscillators to go through a different line or column, and at the same time you could have one of the lines modulate a filter. There are several filters to choose from and you can go out of one filter into another very easily. The low pass filters are very responsive. I also like the formant filter which will give you some vowel like sounds. There can be some extensive mods made to it. The Bode Frequency Shifter is an unusual module. It can produce some 50s sci-fi sounds. I confess I haven't used it much only because I am not too familiar with it. None of my other synths have anything that sounds like it. I find the other filters (high pass, general) mediocre. Another great feature is the Unison mode. This can really fatten up the sound. I have had a few crashes, because it is very easy to gobble of CPU power when adding voices and unison. But in most cases this is a fairly stable program. Does it sound like a Moog Modular? I don't know. I have never owned one. But I don't really care if it sounds like the real thing or not. It sounds great; very warm, fat bottom end, breathy sweeps. A versatile pad machine as well as a strong lead synth. The step sequencer is one of the best features and distinguishes it from most VSTi's. Customer service is ok. I had a question and received an email answer two days later. There is a Yahoo users group as well. A couple other cons: when used in standalone the virtual control pots move easily. But in VST mode they are too sensitive to the mouse. However, with an external controller the pots can be assigned and are easier to control. The graphics are so detailed, it is hard to read the settings. Fortunately a popup with the current setting appears as soon as the mouse appears over the pot. Lovely set of sounds by skawiwen - thank you. Is there much demand for new sounds for the Modular - I have some nice things I could upload if there is interest? Fantastic sounds, thank you Bill ! I especially like the pads a lot.